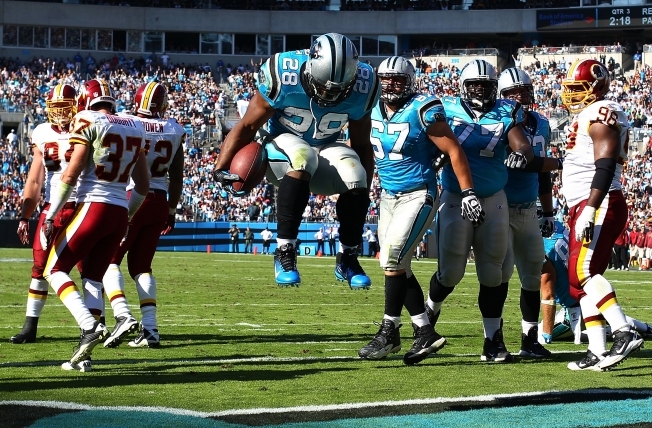 Jonathan Stewart celebrates his third-quarter touchdown, which gave Carolina a 23-13 lead. The tandem of Cam Newton and Steve Smith were too much for the Washington Redskins to handle as they dropped to .500 for the season (3-3) by losing to the Carolina Panthers 33-20 Sunday in Charlotte. Making his first start since 2007, when he was with the Miami Dolphins, Redskins quarterback John Beck completed 22 of his 37 pass attempts for 279 yards, one touchdown, and one interception. For his part, Newton completed 18 of his 23 pass attempts for 256 yards and one score. Each quarterback also ran for a touchdown in the third quarter. Trailing 9-6 at halftime, the Redskins received the second half kickoff and drove into Carolina territory. But a decision to go for the first down on a fourth-and-two play from the Carolina 40-yard line backfired as Beck was sacked for a seven-yard loss. Carolina only needed two plays to extend their lead to 16-6 as Newton hit Smith with a 37-yard pass to the Washington 16 on the first play after the turnover. On the next play, Newton ran the ball in from 16 yards out. Smith was Newton's favorite target on the afternoon, making 7 catches for 143 yards. Beck and the Redskins responded admirably, marching 82 yards in seven plays. It was Beck himself who finished off the drive, scampering into the end zone from four yards out to cut Washington's deficit to 16-13 with 8:14 left in the third quarter. Unfortunately, the Redskins defense couldn't keep Washington close, as Newton led Carolina 80 yards in 10 plays. Jonathan Stewart did the honors this time, crashing over from two yards out to make the score 23-13 with 2:17 left in the third. Washington went three-and-out on their next possession, and Carolina ground down the clock by going 65 yards in 12 plays and 8:26. Newton finished the drive with a two-yard touchdown pass to Brandon LaFell to go with his touchdown run and Carolina led 30-13 with 8:13 to go. Beck brought the Redskins back to within 30-20 when he found Fred Davis with a seven-yard touchdown pass with just over five minutes remaining. However, any comeback hopes the Redskins had ended when Beck was intercepted by Chris Gamble with just over three minutes to go. In addition to the loss, the Redskins face more injury concerns ahead of next Sunday's game against Buffalo. Running back Tim Hightower managed 88 yards on 17 carries before leaving the game early in the third quarter with a left knee injury. In addition, Santana Moss left the game in the first half with a broken bone in his left hand.